As a sign of impermanence, of the temporary nature of life, few objects are better, more universally recognized, more viscerally understood than bones. As a sign we all come to an end, bones do it every time. The rich, important, beautiful. Loved and valued, we all end up bones. Bone. Perhaps there might be some things, now that I take the time to consider it, to better represent the transitory nature of life than bone, but anything else I can think of, and I have never been short on imagination, would not be quite as understated as bone. Bone drives the point but can still appear clean and acceptable. Bone is body but not blood, flesh but not fleshy. It states itself plainly and clearly without comment. Understated. A bracelet of intestines would be noticed in the company of even the most impolite. People will talk. Wear one to your local grocery store or temple and you would see my point. Of course, there was the fellow I knew who made a necklace of his kidney stones. It seems like so much trouble to go through and the total cost rather exorbitant. It took him four bouts before he had enough material. Still, as far as custom made jewelry, how many people can claim to have created their’s from scratch? How’s that for being material. But beads of bone. Unobtrusive. Understated. Inoffensive. Much less expensive than lithotropy. And so, missing my bones and not wanting to use any of my own, homegrown material, I set out to shop for malas. I had a set I had recently given up. They were a gift to me by monks from the Drepung Loseling monastery. Deprung Loseling has been around since the 1300’s. In the 1950’s the Chinese government destroyed nearly all the monasteries in Tibet including, Deprung Loseling, and left alive only two hundred and fifty of its nearly three thousand monks. This who survived escaped, walked though the Himalayan Winter to India, were welcomed and settled in the south of that country where they rebuilt from nothing. For several years running, while I lived in Fort Lauderdale, the monks would fly in from India to come to town to create sand mandalas. Not just Ft. Lauderdale, of course. We were but one location in a tour of several months – a welcomed stop each fall. Each November the monks came to Piper High. I was teaching English at Piper when the email call went out. 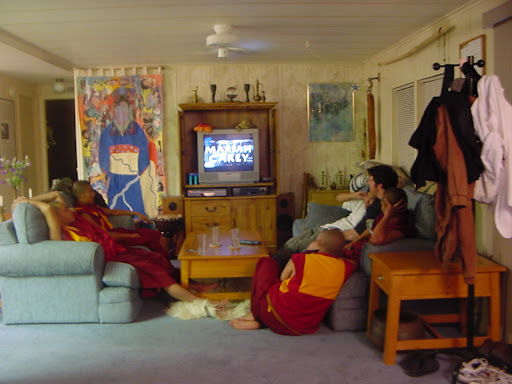 They would be there, in our auditoriuam, nine Tibetan monks, and we needed to find them places to stay. We lived, myself, my wife, Lee, my daughter of eighteen and son of thirteen in a small trailer. I asked my wife is she would mind. Lee was in medical school then and in class or clinic each day and spent her nights in study. On the couch, sci-I on tv, she was inside an oversized text of some four inches thickness each side when splayed open on her lap. I could see her body but her mind – her mind was in the book. I agreed to house three or four of them. In two weeks they would arrive. The day came. This person petered out, that person became unavailable, rides dried up. I arrived home followed by a van with nine monks from Tibet and one translator of questionable ability. This was when I discovered what I had chosen to be unaware of. My wife had not listened to word I had said. It was, obviously, the lack of apple juice. She made that very clear. After the shock. They would be with us five days. It was Chanukah. That came to forty-five presents. two are checking their email. As the week ended, the last night came and the Rinpoche had learned the prayers, in Hebrew. for the lighting of the candles and would do it with us. It took ten seconds but the gesture, the effort was an honour for our household. Barukh ata Adonai Eloheinu melekh ha‑olam, asher kid’shanu b’mitzvotav vetzivanu l’hadlik ner (shel) hanuka. Barukh ata Adonai Eloheinu melekh ha‑olam, she‑asa nisim la‑avoteinu ba‑yamim ha‑heim ba‑z’man ha‑ze. He then led three monks in a prayer for us. That took five minutes. And the presents. Dreidles and chocolate gelt, whistles and small toys. My daughter was offered to come to India and paint tankas. They had been amazed at the collage tanka she created of magazines, shower curtains, old shirts and beads. They gave her an invitation and a Khata – a white silk scarf of welcoming, goodwill and compassion. To my son they gave a khata as well. My wife, a khata and prayer flags and a picture of our monks at their monastery. OUR monks, I say, as the Rinpoche told us, from now on, they would be our monks. To me they gave a khata and wrist malas of yak bone. Rarely did it come off. I used it to breath. To meditate. To count beads on when what I thought what I really wanted to do was throttle someone. When a student or administrator was, in the depths of my mind, being separated neck from torso, I would be smiling, in seeming equanimity, counting beads. After a few bones had slipped between my fingers I knew I really didn’t want to throttle anyone. Everyone thought I was so happy. It would come off when I was mowing the lawn, digging the garden, washing dishes. When I felt it might get caught on something. After a while it started to slip off on its own. But so had my watch. So had, for that matter, my pants. I had lost a good bit of weight and the malas needed to be smaller if I was going to keep them in use. I tied a knot in the cord. It didn’t hold long. I tried to restring them but that didn’t work: the cord would not hold, the knot loosen, the malas slip off. I brought them to bead shops and they seemed not to know what to do with them either. I even showed them pictures but each shop I left, baggy bones clanking around my wrist. Then Carol visited. She brought with her a necklace for me, beads, done beautifully. Her new hobby. I showed her my malas, let them fall over my hand and into her lap. She thought she could fix them. No problem. Carol lives in Boynton Beach. That is in Palm Beach County, Florida. I am a little under two hours north of her. My malas went on a trip to South Florida. I thought it fitting. They are, after all, a sign of impermanence. Nothing lasts. But Carol is my oldest friend. Nothing lasts, ‘tis true. But friendship, in the span of a lifetime, is as close to permanence as one can get. A strong, close, real friendship. 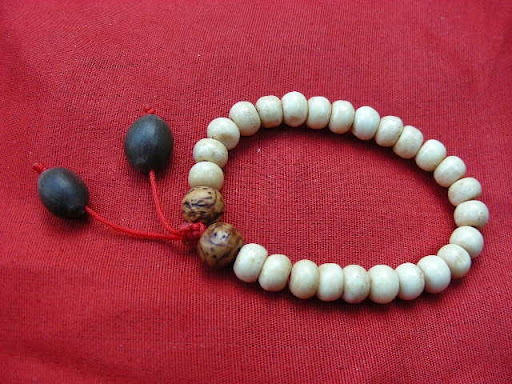 The malas of impermanence fixed by one of the most permanent things of which I know. A friend. I let them go. That was about a year ago. While in Asheville, I looked. While at Pagan gatherings, I looked. In Austin, I looked. At gem and mineral shows I looked. In New Age shops I looked and was frequently lambasted for wanting bone by shopkeeps playing holier-than-though with Tibetan monks. I found nothing. On eBay I found plenty but nothing that struck me, nothing that spoke to me, called me.. It would need to be something I found in person. After all, the last set was a gift. It was the universe telling me a truth. I was thinking to myself. Ruminating. Circular. Maybe I just need to be patient. Maybe a set will come to me. Maybe I don’t need them anymore. Maybe I am playing monkey in the middle with my mind; what is being tossed and doing the tossing the same thing. Maybe… What is that? It’s them. There they are. I had looked up bone malas on the Internet. I am not sure why I did this after having decided to forget about them. Perhaps it was a discussion that morning with the Abbot of the local Thai Temple, Wat Punyawanaram. I was there for the festivities commemorating the opening of the new monastery, for the blessing of he grounds by the community and the blessing of the community by the monks, for the long period when monks do not leave the temple and the laity gathers to bring them the materials they will need for the coming year. I was there with several people from our local Unitarian Universalist Church. We had raised enough funds to supply the monks ten sets of robes and it was my honour to present several of them during the ceremony. I sat with the abbot in a large sanctuary, peopled to capacity, feeling very comfortable – uncommon for me. But I walk into a Buddhist temple and I feel immediately calm, at peace and at home. He asked how my meditation was going. I imagine that is what he said. He speaks only slightly more English than I do Thai. I speak no Thai. He had helped me quite a bit in the last year as I worked teaching, feeling as though I was forcing students to do that which they did not wish, feeling as though I was doing harm, at odds with my vows. I understood him. Common spoken language or none, it did not matter. And, suddenly, I missed my malas. Open Google. Malas bone wrist. I found several pages that felt unsatisfactory. I expected nothing. Then one struck me. What I noticed first was the different materials, seeds and beads and stones and bones of which malas may be made, were explained. Here was a person who understood why I wanted what I did. Secondly, it was set up on a blog. A catablog! Ingenious. He even included a video of what malas were for and how to use them. This deserved a further look. I found what I was looking for, almost. I found a price I could well afford and it was so terribly close to my birthday I didn’t experience my normal need to resist my own wants and trivialize my own desires. Oh, who am I kidding? Of course I did. But the perfection, price and proximity of my natal day won and nearly sealed the deal. What did I do? I hesitated. I wrote him from a link on the catalogue. If this was anything like most email communication, and I was sure it would be, I would log yet another birthday past this present one before I seeing an answer. But here was a man making malas. Making them as they were ordered. For specific people. Not beads sitting in a case. I had to try. I was looking at your page and was wondering if I had missed, or if you could make, a bone wrist mala? I am looking for yakbone with the pulltie as opposed to elastic (which keep breaking). I guess they would be 27 or 18 beads. I’m note sure of a lotus seed or bodhi seed could be incorporated. I do wish there were a way to work the bodhi seeds in as well as the Lotus seeds onto the ends/tassels. Perhaps the last two beads before the slipknot bodhi seeds and the tassel-ends lotus. If not, I would prefer lotus. I want the bone for impermanence. I want the bodhi seed to remind me to sit, to remind me there is nothing to be done about that impermenance. I want the lotus seed so I can remind myself I need not be mired in this, that beauty comes from the mud. I want. Maybe it is because I am an American., but I am suddenly presented with a choice and I choose not to choose. Sure. That sounds like a plan. Bodhi will be the last two at the slip knot and the tassel beads will be lotus. On thick red string. Perfect! The bodhi may be of a different size but not TOO different. The bone does not get darker as time goes on…the oils from your skin will give the bead a translucent quality to the beads over time Great. Would you like a pic of the wrist mala to be sure you are happy with the design before it gets shipped tomorrow? A picture? A picture? Was he serious? And not ten minutes later that is what I got. The mala looks incredible. I can’t imagine not being happy with them. I spent the day at a Thai Temple. The only game in town, as it were, and where all the Buddhists tend to go regardless of being Thai, Tibetan, Cambodian, Chinese or from wherever. In my talk with the abbot I was reminded how much I missed having my malas. So thanks so very much. Subject: RE: Bone Wrist Malas? I learned my craft in Bodhgaya and make malas for many traditions. It is a blessing to serve practitioners and in turn help support friends throughout Asia. I collect supplies by traveling to Asia and hire friends to purchase supplies for me later. I make all malas here on Saltspring but will be returning to Asia for one year in November and will be making malas in Bodhgaya in April next year for six months alongside my teacher to learn more about the craft. Thank you for the payment. This will go out tomorrow. And it did. And it arrived today, seven days later. It is in a yellow package. Eight by five inches. It is oriented vertically and labeled “Small Packet Petit Paquet” The entire package is labled in English and French. The return address tells me it came from Saltspring Island, BC in Canada. My address is below it, highlighted in yellow. Immediately below my address is a space for the listing of contents. It says “Buddhist/Hindu Rosary. On the next line there is a star and the words “Made in Canada.” Below that, a star and the words “For religious purposes.” Everything is in capital letters. It arrived at about four this afternoon. I didn’t open it. I opened the package from Bookmooch. I opened the DVD from SWIM. All this with the sealed package beside me. I read the article in Poets and Writers titled “Will Write for Free: Why Is Asking to Get Paid So Difficult?” by Steve Almond with the still-sealed envelope inside the folded magazine. I had tried to open it. I began, gingerly, to pull back the adhesived fold. It started to give with little pressure and I stopped. I simply could not. Not until I… Not until what? Not until I wrote about it. And now I have. Seven hours or so later, I am here, at the end of this essay. This envelope and me. And now I will open it. I reach my hand in. They feel cool. I pull them out slowly. They are gorgeous. I can’t wait to sit, to count, to breath.